A small wind driven ventilator for sewer systems, pits and drains. 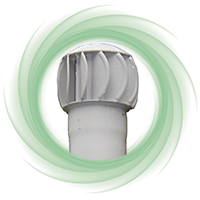 The Sewer Vent is 150mm wind driven ventilator that incorporates stainless steel bearings & aluminium shaft to withstand the impact of noxious air streams from sewers, pits and drains. An active ventilation system is recommended for these applications to ensure there is air movement in the system to decrease gaseous build ups. Ventilation of sewer systems, pits and drains.